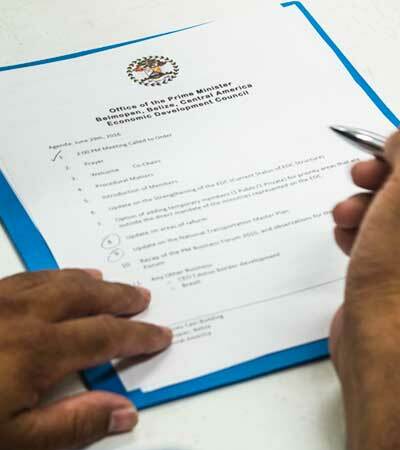 In the context of Economic Development, a reform is an intervention taken to improve and enhance service delivery by the Government of Belize that will result in an improved business climate and economic development. Goal To improve and strengthen the quality of domestic construction and to clarify the roles and jurisdictions of the Central Building Authority (national regulator) and local Building Units at Municipalities (local authorities). 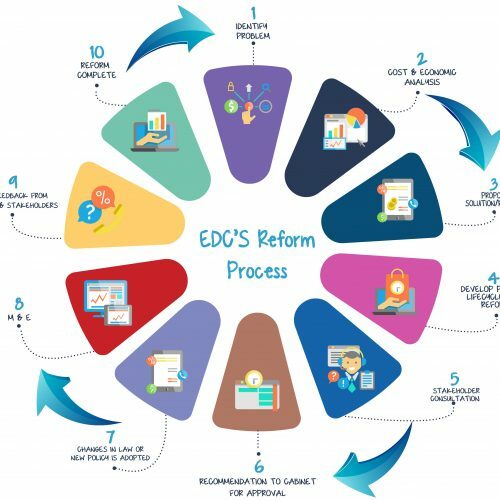 Description The EDC/PPD has completed the initial phases of support to the Ministry of Housing and the reform was transferred to the Ministry in June 2018 for full implementation which includes the certification and operationalization of all local Building Units, the development of Regulations to govern the sector and the elaboration of National Building Codes And Housing Policy. Description There are over 150 public services that will be digitized in the upcoming years via various initiatives by both the EDC/PPD and CITO. Objective Digitization of all public services – Priority for PPD/EDC are the Doing Business areas. 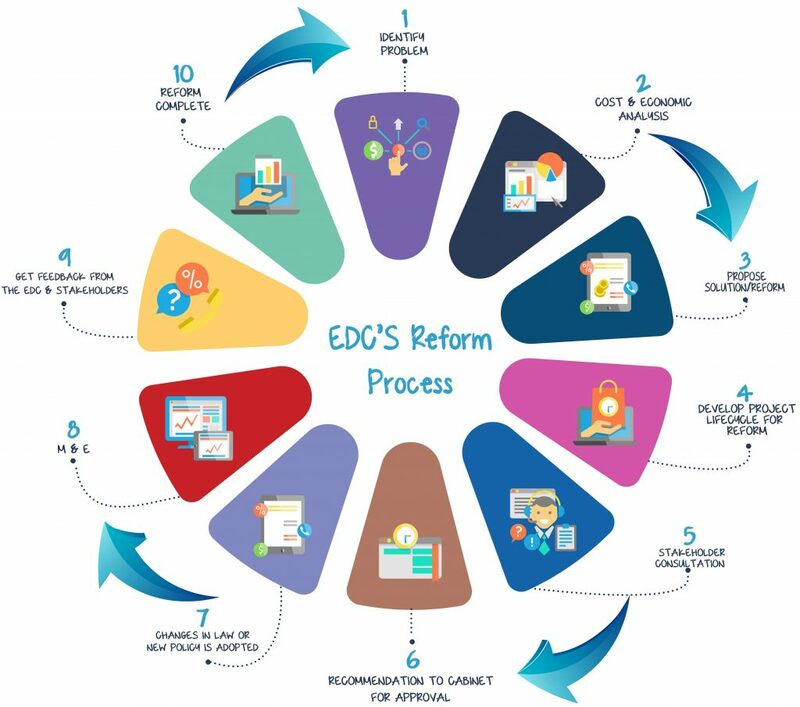 Description The Ministry of Natural Resources in close collaboration with the EDC/PPD aims to improve the Stamp Duty system of land valuation in an effort to improve revenue collection without impeding business development and economic growth. Goal To facilitate greater financial inclusion by providing for the use of movable property as collateral in Belize as a tool for improving access to finance, especially for MSMEs. Description The ultimate goal of a modern and functional secured transactions system is to facilitate access to credit for all sectors and types of economic actors, particularly for SMEs, as well as in the manufacturing, agriculture and productive sectors. Goal To transform public transportation into an efficient system serving the needs of its end users. Description A Comprehensive National Transportation Master Plan has been produced to provide a holistic framework for guiding public and private-sector investments in an efficient and modern transportation system Covering the aviation, maritime and terrestrial sectors (airports, eports and roads). The PPD has submitted a proposal to the IDB for grant funding to implement key short-term recommendations. Goal To increase economic activity by streamlining and modernizing the national tax system. Description The business community has for over a decade advocated for a review and simplification of the existing trade and tax regime (direct and indirect taxes, duties) citing inefficiencies, complexity, cost and inequity. For the government, substantial revenue leakages pose major challenges that affect its ability to consistently deliver and invest in public services. Goal To administer a transparent and equitable Trade License fee regime using a standard methodology. Description Trade License is a fee charged to allow businesses to operate within municipalities. The private-sector has continuously voiced concerns about the and the non-standard manner in which Trade Licenses are it determined and hence the unpredictability to businesses which affects planning and affordability. Description of Reform/ The current Fiscal Incentive act is being amended to be in compliant with the WTO regulations. Impact Stimulate production, investment and trade. WTO compliant. Description of Reform/ The current Export Processing Zone Act is being amended to be in compliant with the WTO regulations and to better suit to current business climate of Belize. Impact Stimulate investment (FDI and Local) development and employment opportunities. Would you use a system where you can pay taxes online?